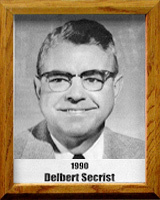 Dr. Delbert Secrist was an All-American football end at Washington and Jefferson who went on to become one of the most-beloved citizens of Tucson after he moved to Arizona as a sports-minded physician. He played in the East-West Shrine game in 1930. He once said, “I can credit almost everything I am today to football” and he gave back to the sport, and the community of Tucson, in many ways. He served as team physician for UA teams, also for Tucson High School. He served on the Tucson Unified School District Board for 10 years, the last five as president before his death in 1970. He also served as assistant football coach at Wisconsin and scouted football games for the legendary Pop Warner. He served as a major in the U.S. Army from 1942-1946. Because of Tucson’s reputation for being ahead of the nation in school integration, he was personally contacted by President Kennedy in 1963 to explain “What are you doing to make things run so smoothly in your schools?” He spearheaded a fund drive to enlarge the Lohse YMCA building at 516 N. 5th Ave. He helped countless less-chance youngsters in many ways, including free medical care. Secrist Middle School is named for him, and he received several national awards for his work with youth and as a physician. He emphasized that sports were just as important as academics in molding the lives, values and courage of youngsters.